Last week shall forever be known by DFS players as “The week we do not speak of.” This is why bankroll management is so important! 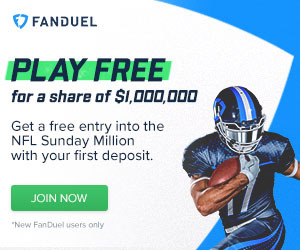 Now, with more information available, we can examine my week 3 value picks at the quarterback, running back, wide receiver, and tight end position for Draftkings daily fantasy leagues. By comparison to other DFS sites, Draftkings values vary widely in range. As such, a little digging through the players can yield a lot of reward. Let’s look at some names I like as solid value plays to help fill your Draftkings lineups this week. 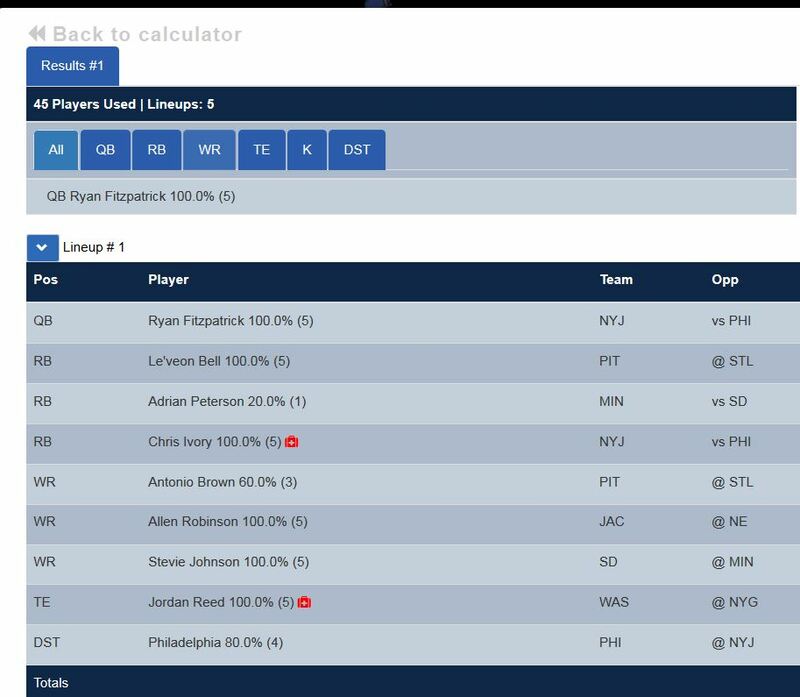 I’ll also be working with Fantasy Knuckleheads innovative DFS tool to compare its “likes” with my own. Here's some more week 3 value picks on Draftkings. Our optimal lineup tool uses Fitzpatrick in all of its top-5 lineups, and I agree. In the lineups I’ve assembled so far, Fitzpatrick finds his way into over 80% of them. So far in 2015, he has been consistent with his production, doling out double-digit fantasy performances in both appearances. I think Fitz has a low floor, but this week he may also have a high ceiling. Brandon Marshall has been simply outstanding and, though Fitz’s second option Eric Decker may be injured, I like him to build on his success thus far. It’s almost impossible to find this sort of production for the insanely low price. Our optimal lineup tool uses Fitzpatrick in all of its top-5 lineups, and I agree. Newsflash: the Ravens defense is no longer to be feared. Baltimore couldn’t stop David Carr and Michael Crabtree, what will happen when Dalton, AJ Green, Tyler Eifert, and Giovani Bernard come to town? Good things for Dalton owners, that’s what. Are we sensing a theme here? Remember: Draftkings is a PPR format, so any RB who catches a guaranteed 3-4 balls is gravy. Bernard is cheap, but I still view him as mainly a tournament- not cash- play. He has high upside but the Jeremy Hill factor can always come into play. He’s the only guy, and they’re going to score, possibly a lot. I know, I know. Indianapolis has looked terrible thus far. But, they have to wake up eventually, right? The match-up against TEN is enticing and Gore is another guy who gets all the work. I refuse to believe the Colts are as bad as their record and I think this is the week things start to turn around. There’s no place better to get healthy than a divisional game against an opponent ripe for the falling. The pass-catching half of the best (arguably) offense in football? Sign me up! Part matchup and part simply the fact that he looked pretty good. I don’t think TY Hilton is entirely healthy just yet. Moncrief should get his fair share of targets and has a better than even chance to find the end-zone. Hard to find the production you’ll get from Moncrief at this price in the WR category. The better version of the 2014 Eddie Royal role. Johnson has a nice early rapport with Rivers, a decent matchup, and is producing well for his new team. Love him as a WR3 or flex play this week. After a disappearing act in week one, Robinson bounced back in a big way. The Patriots can be thrown on and I don’t think it’s too much of a stretch to believe that the Jags might just maybe be playing from behind. He’s Blake Bortles’ best threat, and I think he’ll get plenty of looks this Sunday. This is more about his price than anything. Rodgers is a great value at the cheapest available price on a competent offense that has a few banged up weapons (Eddie Lacy and Davante Adams). Usage and match-up is the key to this value pick. I think Davis is going to have a few nice weeks this season, and this should be one of them. I usually don’t like recommending D/ST plays as it’s really match-up and staying alert to information as week 3 unfolds, but the Broncos D/ST has been absolutely lights out. They produce sacks and turnovers, the two main scoring areas. Against an under-performing Detroit team, even on the road, I like them this week.